Corgi Shih Tzu Mix: Would This Adorable Pup Suit You? You are here: Home / Breeds / Corgi Shih Tzu Mix: Would This Adorable Pup Suit You? The Corgi Shih Tzu mix is the party animal of dogdom. But what else do these adorable pups offer? Where are they from? What are they like? And what does a Corgi Shih Tzu mix offer you? Where Does the Corgi Shih Tzu Mix Come From? Let’s take those questions (and more) one at a time. The Corgi Shih Tzu mix is a fairly new “designer dog” that has just recently been developed. As their name indicates, these dogs are a cross between a Corgi and a Shih Tzu. The Shih Tzu parent is among the dog breeds that date back the farthest in history. Originating in Asia as companion pets, they first came to England in the 1920s. At times, they live up to their name—”little lion”—in the most surprising ways. The Corgi side of the family is a little more complicated. Two different breeds of dogs go by this name: the Cardigan Welsh Corgi and the Pembroke Welsh Corgi. The Corgi side of the family can be either of these breeds. This split is fairly recent, dating back about 80 years. 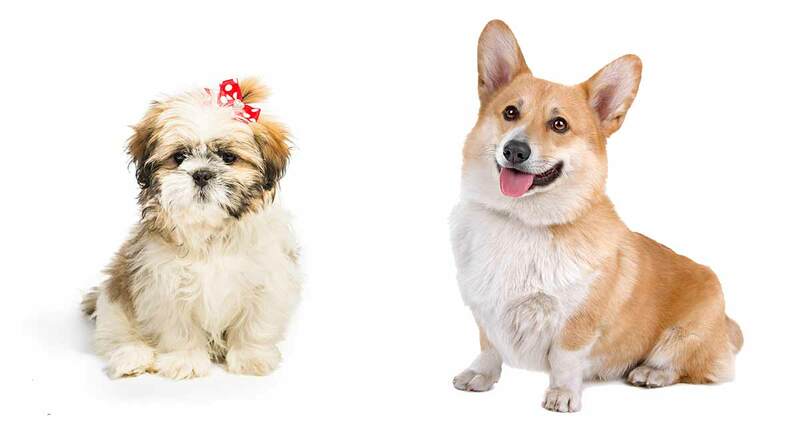 As both breeds are very similar, the small differences in either potential parent do not have much final influence on any given Corgi Shih Tzu mix. While this breed may not be well-known in the media on her own merits, at least one parent breed is. Queen Elizabeth II is known for enjoying the company of Corgis. On the other side of the family, Shih Tzus have been seen in centuries-old artwork and designs. It is generally believed that they are either from China or Tibet, though it can’t be pinned down for sure. As with all mixes, many more fun and individual facts exist in each pup, just waiting for you to find them. How big do these pups get? What’s a healthy weight range? And what do they generally look like? Corgi Shih Tzu mixes tend to be anywhere from 10 to 14 inches in height. They weigh around 20 to 50 pounds, depending on which side of the family they take after more. Eye color tends to be blue or brown. Their medium-density coats can be red, brown or fawn. That combined with these dogs’ medium-length coats makes grooming a bit easier overall. Depending on the parent, many of these things can and do change from pup to pup. However, when you see one of these dogs, these traits generally come together to make a short-legged, long-bodied smaller dog with a cute, round head. Now that the basics are out of the way, it’s time to turn to some equally important but not physical traits of these pups. What are the usual temperament and disposition of a Corgi Shih Tzu mix like? Affectionate is the keyword here. These dogs want to love you and to be loved in return. However, that can come out in some very interesting ways. While they can be sweet and cuddly, it takes some training to get to that point. Corgi Shih Tzu mixes are stubborn and smart. And because they are party animals, they need lots of time with their owners and families, regardless of any other schedule requirements or family needs. How can you best channel the love and affection that a Corgi Shih Tzu mix has into a loving relationship with a well-adjusted pup? Let’s start with the basic blocks to train small dogs. A Corgi Shih Tzu mix needs lots of loving but firm boundaries to channel her willful side into the appropriate avenues. While these pups learn quickly, they do like to challenge their owners and families. If this is a struggle, obedience classes under caring professionals may be the best option. These dogs do learn; they just like to keep you on your toes. Keep rewarding and loving your pup, and training will be much easier all around. On a more day-to-day level, a Corgi Shih Tzu mix takes well to simple tasks, such as potty training. They need about 45 minutes a day of active time, whether that is walking or romping about. And as with most dogs, it’s important to socialize them with other dogs on a regular basis. For more advice and more specific tips, check out our puppy and dog training guides. These provide a great overview and practical advice to get you started or to keep you going. What are these dogs’ health needs? Are they easy to care for? And how do you give them the best life that they can have? First of all, these dogs have no daily health issues that affect the whole mix. They generally tend to be healthy and have a life span ranging from 12 to 15 years. In addition, they have no specific diet needs, though quality food as always is a must. How about more major and minor issues? Let’s start with the minor issues. Eye infections and eye issues may crop up from time to time. Regular vet visits should be sufficient to cover these. Major issues include the possibility of hip dysplasia and epilepsy. However, a far more serious issue that these dogs face is intervertebral disc disease. Unfortunately, this condition does not have a long-term reliable solution, further complicating these dogs’ lives. This can lead to a lifetime of problems, and is a very serious consideration for Corgi Shih Tzu mixes and their potential owners. Do Corgi Shih Tzu Mixes Make Good Family Dogs? Because of the major health issues that Corgi Shih Tzu mixes face regarding intervertebral disc disease, this is not a recommended family breed. Puppies in particular face a lifetime of potential debilitating problems that may require cage confinement, long-term pain medications and major surgery. For those reasons, Corgi Shih Tzu mix pups are not recommended. However, this doesn’t rule out the possibility of helping out an older dog who may be looking for a forever home. In those cases, a Corgi Shih Tzu mix’s natural temperament and size may make them a great fit for your family. Be prepared for more vet visits and monitoring if you decide to go this route. It’s easy to check shelters and different organizations around you to look for a new family member. But those places don’t tend to keep an inventory of designer dogs suited to all. How should one go about rescuing a Corgi Shih Tzu mix in particular? A great alternative place to start is with focused groups or wider organizations that specialize in new mixes or either of the parent breed. Explain your goals to them and see if they can help. These focused groups are also on the Internet. If you’re willing to drive or take a vacation around rescuing a Corgi Shih Tzu mix, you can expand your range and open up your options. If you are very invested in finding a Corgi Shih Tzu mix puppy, it can be done. First things first: please steer clear of puppy mills and designer dog factory settings. Sadly, these people are only in it for the money. They do not care about the overall health and wellness of these pups and their parents. Your best bet is to find and get into touch with reputable breeders around you. Social media can help to some extent, but the best breeders may not need it. Ask around at veterinary offices, with mutual friends and others who have recently found pups. These people have connections and knowledge that hopefully you can tap into on your journey to find the puppy of your dreams. And at the very least, you can enlist more people to assist in your search. Depending on your needs, a simpler place to start your journey can be found at our puppy search guide. You can get a neat overview of the subject at any hour of the day and be better prepared if/when you call up the wider community. How should one go about raising a Corgi Shih Tzu mix puppy? Lucky for the rest of us, most puppies can be raised in similar ways. A great place to start is at our puppy and dog training guides. These provide a nice overview of the topic and actionable steps all in the same place. From the first-time owner to the experienced trainer, there’s something for almost any interested person. Something to keep in mind for Corgi Shih Tzu mixes in particular is that they can be very willful puppies. Loving and firm boundaries need to be set up right away for best results. They will test you, but it’s only because they love you. Sometimes teasing is fun and makes for great stories later on. What are the pros and cons of getting a Corgi Shih Tzu mix in particular? Do you like certain traits of these dogs but find other aspects not to your taste? Other options that we can recommend are out there. These mixes and dogs avoid more of the issues that may plague a Corgi Shih Tzu mix, while keeping what’s lovable about these dogs. They also provide great options for companionship and fun in a more sustainable, healthy way. There aren’t a whole lot of easy ways to rescue a specific dog mix, particularly one such as a Corgi Shih Tzu mix. However, it still can be done. While no individual organizations exist to recuse these pups, they do exist for both parent breeds. These groups are worth inquiring about to help you find a pup and probably have ideas worth sharing. It may take longer, but hopefully you are giving a wonderful dog a second chance. Is a Corgi Shih Tzu Mix Right for Me? A Corgi Shih Tzu mix puppy is probably not right for you. The amount of health issues and suffering that they can (and probably will) face throughout their lives is not normal, nor is it good for any animal to have to live with for extended periods of time. However, depending on your needs and desires, an adult Corgi Shih Tzu mix might be just right for you.